Mr. Z is a brand of beef jerky owned by International Food Company, based in Sao Paulo, Brazil. The jerky is manufactured completely in Brazil, and distributed through IFC's USA-based affiliate, International Food Company, USA, LLC. Being it's still a new brand to Americans, it's a difficult jerky to find. Most of it is found in discount stores and airports. Because of its scarcity, Mr. Z has become a top seller on Amazon.com. IFC seems to be leveraging its low-production costs to take sales away from American jerky brands. 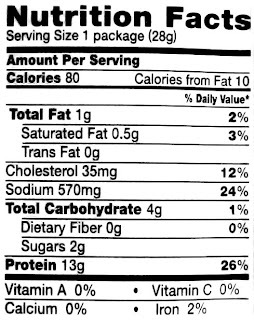 Beef, water, sugar, salt, glucose, soy sauce, hydrolyzed soy and corn protein, smoke flavoring, onion powder, partially hydrogenated soybean oil, monosodium glutamate, silicon dioxide, glycol propylene, flavoring, sodium erythorbate, sodium nitrite. This is the first jerky I've come across with glycol propylene, the main ingredient used in sexual lubricants. The taste I pick up from the surface of these pieces is a soy sauce flavor, and a bit of sweetness. In the chewing, I can pick up more soy sauce flavor and a salty flavor. When I chew a piece immediately after putting it into my mouth, what I taste is the soy sauce flavor in a slightly weaker intensity, and lighter amounts of sweet and salt. I'd say the dominant flavor of this jerky is that soy sauce flavor. It seems to resemble the chinese style soy sauce. It's pretty much what I taste from the surface, all the way to swallowing. The saltiness is perhaps the second-dominant flavor, and is probably just an extension of the soy sauce. It seems to have a moderate intensity level, it's not too high for me. That bit of sweetness from the surface could be considered a third-dominant flavor. I only taste this in the first few seconds of putting a piece into my mouth. You get this little bit of sweet initially, and then it wears off and I'm left with soy sauce flavor the rest of the way. It's worth noting that this package has a "Best Before" date of March 10, 2009, which is about a month-and-a-half away from when I bought this package. The meat does seem to have a stale quality to it. It doesn't taste turned, or rank, however. This is largely a dry jerky, but still with a bit of moisture. Overall, these pieces will crack and break easily if bent with the grain. The chewing seems fairly easy. The chewing texture is largely crumbly. Some pieces seem to have a fibrous quality, and do give off a meat-like, or steak-like chewing, but other pieces didn't chew like meat. They tended to chew down into tiny fragments and granules that didn't mesh. But in comparison with other brands I've had, this seems to have an average level chewing texture. For the most part it seems to eat cleanly. I didn't pick up any powder or residue on my fingers, but I did note some tiny fragments falling on my desk and lap. Several pieces contained some significant amounts of fat but I didn't necessarily notice a change in taste. But there was enough fat on some pieces that it coated the roof of my mouth with a lard-like feeling. I also found a few pieces that left behind some unchewable wads of connective tissue. I paid $1.00 for two one-ounce bags of this jerky at a Dollar Tree store in Murrieta, CA. That works out to a price of $0.50 per ounce, making this a cheap buy. For general jerky snacking purposes, at this price, it's a decent value. I actually don't get much snackability out of this. Maybe a little. For the most part, all it's really offering is a soy sauce taste. It's probably worth buying in the one ounce package because you can rid yourself of excess coins in your pocket and get something to munch on. I don't think I'd buy a larger package, however. 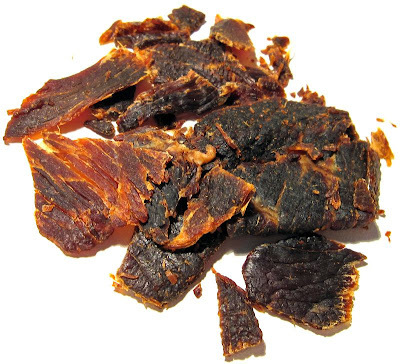 This original variety from Mr. Z doesn't really offer much to the jerky snacker aside from soy sauce, an average chewing texture, and easy eating. You can eat this and be ok with it, but you won't find any reason to call it good, great, or decent, at least not in terms of taste. And I don't think you'll find yourself reaching for more and more, unless you've been fasting for more than 24 hours. However, when I take a look back at all the bargain jerky brands I've had costing $0.50 or less per ounce, it's actually one of the best I've had. 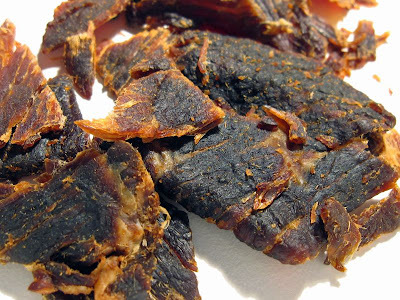 I just posted a review for Dollar Tree's store brand jerky a couple of days ago, which is a Mirab product, and it's worst tasting than this, and costing slightly more. Still, I won't be buying more of this jerky as it just doesn't provide any kind of snacking satisfaction. However, I do have packages of their hot & spicy variety left to review. For a beer recommendation, I'd go with a porter; the dark roasted malt will probably compliment the soy saucy flavor of this jerky. I got this at dollar tree for $1 at 4 oz. Some pieces were very tough but buying it with only a couple months away from the "best before" date on the package that may have something to do with it. Mr.Z Beef Jerky is THE BEST Jerky I have ever eaten! Mr.Z Beef Jerky is THE BEST Jerky I have ever eaten also.